This corded necklace is made using leather cord along with satinique cording. The length can vary from about 17 to 20 inches with a center jeweled piece that adds 3.25 inches. It is monochromatic, in beautiful shades of coral, salmon and watermelon. 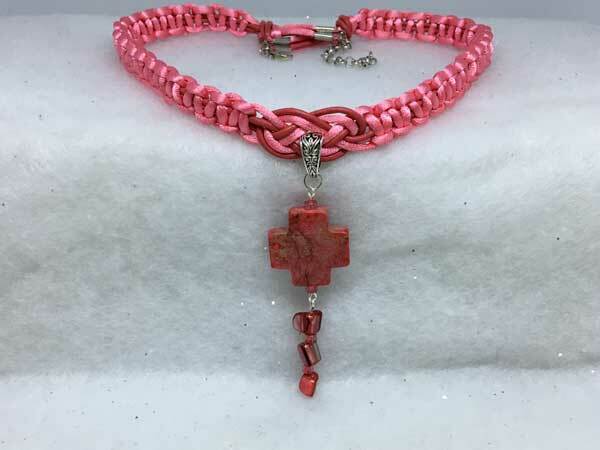 The focal bead is a beautiful marbled stone cross surrounded by coral seed beads on top and bottom. It is hanging separately from 3 shell chips in the same lovely color, all separated by the same glass seeds.